For over 35 years, EFA has fought for freedom, democracy and peoples’ right to decide upon their own future. 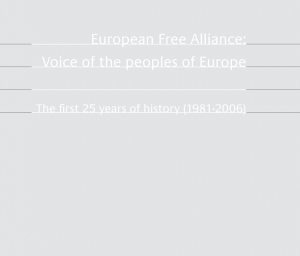 As an answer to the ongoing difficulties met by stateless nations, minorities and regions of Europe to have their own voice heard, a group of democratic nationalist and regionalist parties agreed in July 1981 to establish the European Free Alliance (EFA) symbolized by the signing of the “Declaration of the Brussels Convention”. 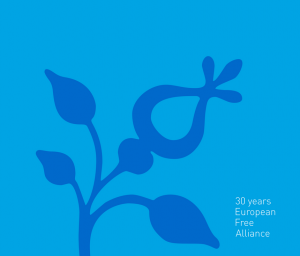 This declaration marked EFA’s foundation and was the result of two previous meetings, held in the summer of 1979, that led to the signing of the “Charter of Brussels” and the “Declaration of Bastia”, in which some parties (that later on, in 1981, would found EFA) decided to cooperate in defence of the “Europe of the Peoples”. EFA has been represented in the European Parliament (EP) since the first European elections in 1979. At that time Maurits Coppieters (member of the Flemish party “Volksunie” –VU-) took the lead in pushing forward the idea of the “Europe of the Peoples” within the parliamentary group of the TCDI (Group for Technical Coordination and Defence of Independent Groupings and Members). Since then EFA MEPs have developed Coppieters’ roadmap, initially through their membership of the “Rainbow” Group, followed by the “European Radical Alliance” Group and, and afterwards, the Greens/EFA Group. 2004 marks the transformation of the, up until then, EFA federation into a pan-European political party recognized by the EP. In that year the EP decided to create a separate structure for European parliamentary groups and European political parties a decision based on transparency and for democratic reasons. EFA fulfilled all the criterion to be recognized as a European political party by the EP, and has remained so ever since. Since its foundation, EFA has undergone several enlargements. From eight members in 1981, to its current 46. These are political parties representing the different stateless nations, regions and national minorities of Europe. Together with our Coppieters Foundation and our youth branch EFAY, we have work in the past mandate of the European Parliament for more respect for the principle of self-determination. We were shoulder to shoulder with our parties during the Scottish referendum and the Catalan referendum on self-determination. Also in the last mandate we had uninterruptedly 10 EFA member parties in government.